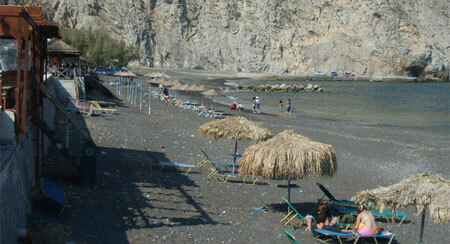 Perissa - together with Kamari - is one of the two big and well known beach resorts on Santorini. Along the fantastic beach with its black sand are hotels, bars, restaurants and souvenir shops. By Santorini standards it is still OK. It is a fully developed beach resort that caters for package holiday makers and backpackers. The beach is quite unusual. The sand is black; a result of the island being volcanic. As a result it gets incredibly hot in summer. Don't forget to bring sandals. You will burn your feet within seconds otherwise. Of course it looks cool. Black beach, blue sea, one doesn't have to go to Hawaii to see that. We recommend pension Villa Dimitris in Perissa (Santorini). Right behind the beach is a road. Along that road are shops and beach bars. Behind that - in the parallel road - are most of the hotels and restaurants. 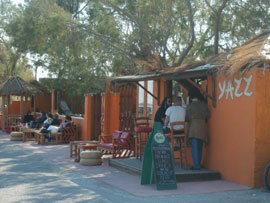 The atmosphere in Perissa is pretty laid back and much nicer than in Kamari. Unlike other places you won't only find package holiday makers but also a number of backpackers and so called dropouts; people that left home for good and now try to make a living in Greece. Despite its laid back appearance prices are still quite high. As a rule: The further you go from the beach the cheaper it is. 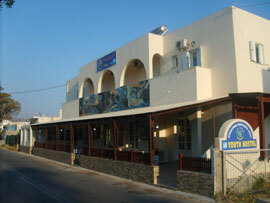 Accommodation in Perissa: Perissa hostel is the cheaper of the two hostels on Santorini. Hostel Anna is quite all right and a bed cost about 8 Euro a night. The new owner Michalis rents out cheap single and double rooms as well. In low season you get a room for about 25 Euro. The rooms are 200 meters away from the hostel. When you arrive by boat simply look out for the Mini Van or a guy with the sign "Anna Hostel". You get a free lift to Perissa. Another good thing about the hostel is that you get 15% discount in the restaurant Atlas just across the street from the hostel. Needless to say that you can book a private room through a travel agency as well. Prices vary. Check with your local travel agency. 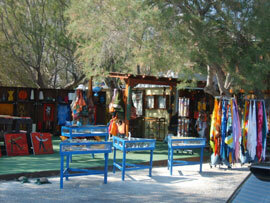 My favourite in Perissa is the pension Villa Dimitris at the end of the village, about 200 meters from the beach. Nice double rooms are as cheap as 25 Euro most of the year with private kitchen and free WI-FI. 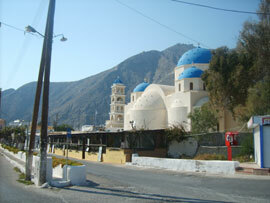 Busses to Perissa: From Perissa there are frequent busses to the capital Thira. In 2007 a ticket cost 1.90 Euro. Busses go at least every hour. During high season there are additional busses to the ferry port. The departure times depend on the ferry schedule. Busses go well in advance depending on when the ferry arrives/leaves. This only works for bigger ferries.